While it’s hard to go a day without learning some new detail of the National Security Agency’s vast data collection program, an interesting piece of context often gets lost: Americans’ blanket distrust of governmental, and even nongovernmental, entities. It is widespread, but partisanship still structures attitudes about privacy. Privacy is an issue in the 2014 campaign, and we expect to see it grow as March 4 looms and the campaigns get more public and more intense. 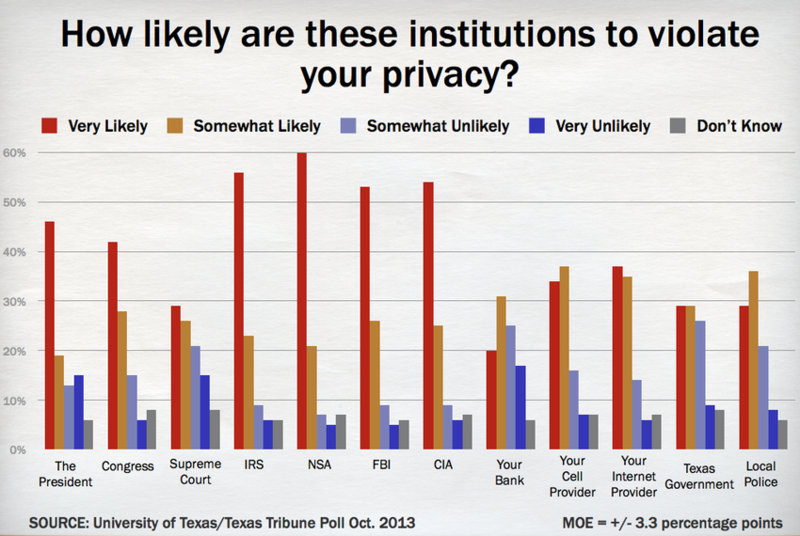 The October 2013 University of Texas/Texas Tribune Poll asked Texans about the likelihood of privacy violations by a number of private and public entities. Not surprisingly, the results show a public suspicious of government. However, the suspicions aren’t limited to the NSA, or even to government institutions. Among the entities included in the October poll (NSA, IRS, FBI and CIA; Congress, the president and the Supreme Court; and your bank, internet and telephone providers), a majority of Texas voters expressed the opinion that it was "likely" that each of them would violate their privacy. Not surprisingly, the NSA fared worst of those tested (81 percent expressed the opinion that it was likely that the NSA would violate their privacy). So, too, did other federal law enforcement and intelligence gathering organizations like the FBI and the CIA (79 percent each) and — maybe not surprisingly given recent news coverage — the IRS (also 79 percent). The three branches of government didn’t escape the wary eye of Texas either: 70 percent thought Congress was likely “to violate your privacy rights,” 65 percent said the president would, and even 55 percent said the Supreme Court would, too. Private entities like internet and telephone providers — possibly perceived as complicit in the government’s actions — were also counted untrustworthy on privacy issues (72 and 71 percent respectively). Respondents found their own banks most trustworthy, with only 51 percent saying that their privacy was likely to be violated by the money changers. It makes the financial crisis of 2008 seem like so long ago. So while distrust of the NSA in particular has reached a crescendo in media coverage after a long and steady ascent, it has done so in this context: Texans in particular, and Americans more generally, distrust government, government entities and those seen to be working with the government — like telephone and internet providers. As with almost all things political, partisan overtones play an important role. When the Edward Snowden affair began, we wrote that the expressed ambivalence of politicians toward government data collection and national security reflected well-founded public ambivalence. However, with a Democrat at the helm of the executive branch and in charge of these programs, partisan filters seem to have sorted these evolving attitudes in the expected directions. While 83 percent of Republicans think that the president is likely to violate their privacy, just over half that percentage of Democrats agree (44 percent). It is tough to say whether Republicans are simply returning to a steady distrust of government that they had set aside during the Bush years, or whether the rote politicization of a multi-administration program — that is, placing the blame mainly on President Obama — has led to partisan differences in perceptions of potential impropriety. What is clear is that overall, a greater share of Republicans than Democrats in Texas distrust every single one of the federal government entities that we tested, a striking contrast to a not-so-distant past when FBI programs actively placed agents provocateurs in liberal and radical groups, and radicals broke into the FBI to expose them. As primary season kicks into high gear, it should be further noted that, especially here in Texas, where distrust of government runs deep, Republicans identifying with the Tea Party are far more distrusting of the complete range of entities tested — save the local police — than their non-Tea Party counterparts. More than 90 percent of Tea Party Republicans think the NSA, IRS, CIA, FBI and president are likely to violate their privacy; more than 80 percent think Congress, their internet provider and their cellphone provider are likely; and 69 percent think the Texas state government is a likely privacy violator, too. Greg Abbott, the attorney general and likely Republican nominee for governor, has already unveiled a privacy agenda (rolled out in conjunction with his declaration of support for open carry). Perceptions of government threats to privacy, broadly shared among a prized faction of the GOP primary electorate, suggest that the anti-government rhetoric common in many Tea Party circles remains valuable political currency in the 2014 GOP primaries. Republican candidates in competitive primaries go to great lengths to play to the Tea Party faction of the electorate, relying on ever more shrill rhetoric on immigration to the sudden emergence of the 17th Amendment as a matter of debate. They can be expected to become ever more emphatic in their attempts to distinguish themselves in crowded races where candidates already are elevating their attacks to try to make the runoffs. Stoking suspicions about government violations of privacy can be expected to resonate with GOP voters — you can take that to the bank.